Japanese EM Records dug up and beautifully presented, the long lost Travelon Gamelon, a piece by Richard Lerman for amplified bicycles! 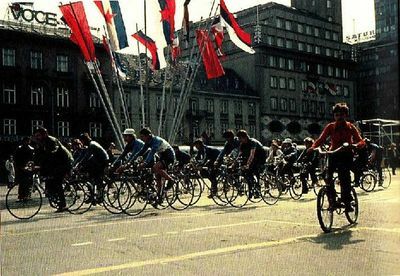 Performed on stage with upturned bikes, but also, performed on the streets, the bikes mic’ed and each with it’s own tiny amplifier broadcasting the various sounds of the bike rolling along streets,the metallic flutter of spokes, the sounds of passing cars, squeaking brakes, whipping wind, all woven into the organic whole. A piece of moving music, constantly shifting, obviously improvised and random, and so totally wonderful. There are two versions of the piece, which has been performed for years allover the world, one is the concert version, which features musicians on stage, with upside down bikes, using various implements with which to strike, rub and bow the different parts of the bicycles, these are the versions that are the most gamelan like, a gorgeous assemblage of metallic clangs and percussive clamor. From dreamy and spare, to cacophonous and wildly chaotic. A sort of junkyard gamelan, definitely clattery but also strangely melodic. But it’s the other versions, the Promenade versions, that are the most exciting. 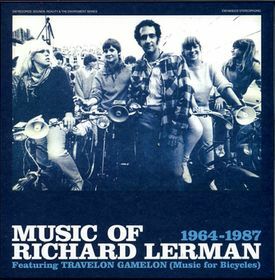 These pieces are basically field recordings of cyclists on mic’ed and amplified bicycles, every sound their riding creates being broadcast throughlittle speakers affixed to the bikes, and recorded by Lerman! So not only is this group of bikes creating this gorgeous whirring mechanical ambience, that sound is also travelling through city streets, a self contained performance of sorts, a strange little cloud of metallic shimmer and buzzing mechanical ambience performed for all passersby. It’s also cool to hear the organizers’ instructions, children laughing and playing, running alongside,ringing their own bike bells, you can hear Lerman giving orders to the cyclists as they prepare to begin the piece, and various warnings like “Watch out for the metal!” Street cleaners, random cars, voices and footsteps, all a sort of organic backdrop to the divine slow shifting whir the bicycles produce. recapturing them with microphones placed at various distances, well, Travelon Gamelon is almost like a mobile Taj Mahal Travellers. 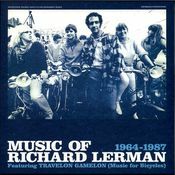 This collection would be well worth it for disc one alone, 5 lengthy excerpts from various performances of Travelon Gamelon, but also included is a second disc, of various other pieces Lerman composed and performed over the years spanning 1964-1986. For Two of Them was composed in Dec 63 / Jan 64 using tape music technique of splicing, layering, speed changing, filtering and an old spring reverb unit. The source material is almost entirely from records except for sound from a white noise generator and one oscillator. The records used were „City of Glass” by Robert Gattinger and the Stan Kenton Big Band and the Mahler 6th symphony. 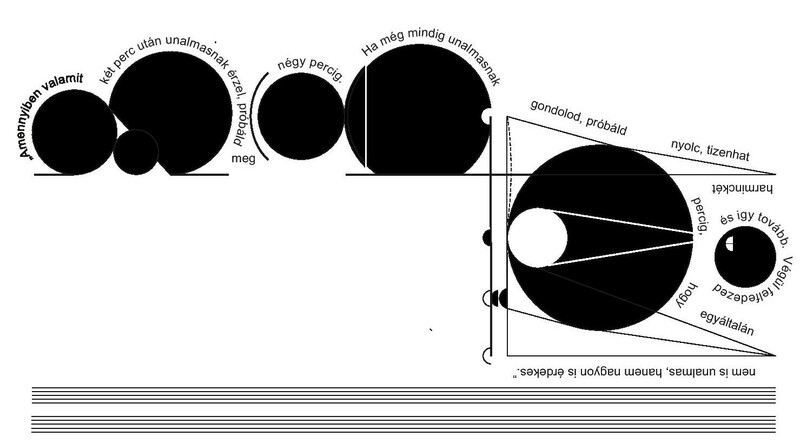 Section for Screen, Performers and Audience is a 16 mm film that is scored for any number of performers and serves as a framework for improvisation. The performers and audience view the film (the performers have their back to the audience as they face the screen). The score was generated by oscilloscope imagery from sound with Hi-Contrast music imagery superimposed. The improvisations of the musicians are electronically modified and extended as the sections of each piece fade into black. performance at the Boston Conservatory of Music, Oct 26, 1975. “End of the Line” used a tape delay that was 20-25 seconds long. Performers were to choose notes to play and when they heard the delay, pick new notes from the selection and play again. Recording into the tape delay was controlled by my performance using electronics. At time, filters, ring modulators, and/or frequency shifting was used to modify the recorded sound. When performers did not hear the delay enter on time, they were to crease playing. As more players dropped out, the section would come to and an end. This was performance at Brandeis University at memorial concert for composer and friend John Boros and his wife, Emi who died when subject of high speed police chase collided with their car in the Boston area. 2. a forty foot long amplified slinky from a science supply house used to demostrate wave motion. The sound is unique. 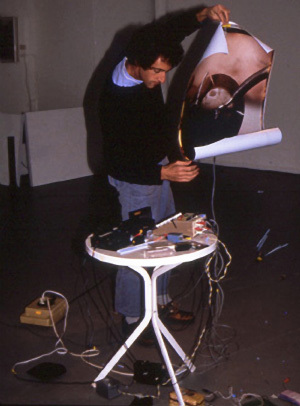 Lerman suspended the toy piano tines from the ceiling with harpsichord wire and attached piezo devices to that wire. He also attached another harpsichord wire to the device so that he could pull on it – therefore streching the wires in the system and making doppler shifts from the bowing of the metal tines. The slinky was also suspended in similar fashion and by pulling on and bowing a thread, a wire range of sounds was possible. The performance of the two instuments was mixed together. Music for Plinky and Straw was precursor to the piece A Matter of Scale that was performed inside the Houston Astrodome. The piece was premiered at Mobius in Boston, with Malcom Goldstein, Larry Johnson, Tom Plsek and myself. This is the solo version of the piece and was performed at the Old Meat Market Craft Centre in Melbourne, Australia in July, 1986. This entry was posted in no wave show on 2013-05-14 by en. 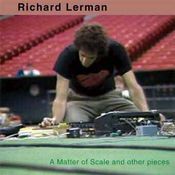 Richard Lerman (Dec 5, 1944 in San Francisco, CA) is a composer, filmmaker, sound artist and minuscule-microphone wizard whose, “work…centers around his custom-made contact microphones of unusually small size,” including, “piezo disks and other transducers”. While growing up in Milwaukee, Lerman played trombone, listened to jazz, and upon hearingDarius Milhaud’s “Le Creation du Monde” was inspired to begin studying modern composition on his own while still in high school. Lerman then studied film, as well as composition, at Brandeis College. There, he worked in the electronic music studio, first started working with piezoelectric transducers. He studied with Alvin Lucier, Gordon Mumma, and David Tudor. 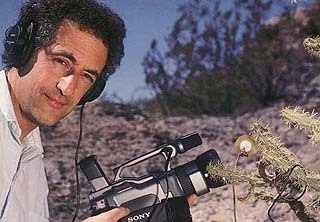 Richard Lerman is the populist of field recording technology. He makes inexpensive microphones out of piezoelectric disks (small, flat pieces of metal), attaches them to blades of grass, and lets raindrops fall on them. Sometimes he lets hundreds of ants walk all over them in the desert. The sounds he produces are immediate, shocking, intensified, and brilliant. Numerous well-placed mics are essential to his work recording environmental sounds not easily heard (or noticed) by humans. 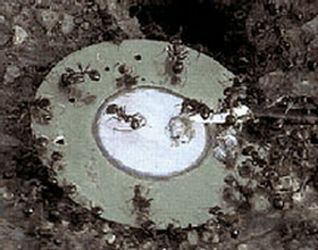 Lerman’s work is often site-specific. Pieces include Travelon Gamelon, for amplified bicycles; A Seasonal Mapping of the Sonoran Desert, which includes cactus needles plucked by rainfall; and the collaboration (with Mona Higuchi) Threading History, for which he recorded prison camp barbed wire. In the 80s he lived in Boston and taught at the Museum School and the Center for Advanced Visual Studies at MIT. His recordings and performances rely on everyday objects and traditional instruments as well as basic, self-invented equipment and state-of-the-art technologies, as they were available since the 1960s. 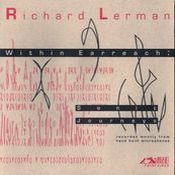 Lerman’s scores and instructions are deceptively simple, yet produce extraordinary results. As a filmmaker, sound documentarian, installation artist, and collaborator with other artists, he demonstrates that his conception of sonic reality and musical experience is interdependent with visuality, motion, actual sites and moments, theatricality, live audiences, and politics. As the various pieces convey, his art takes him from studios and concert halls to cities and the outdoors worldwide. This entry was posted in composers / musicians on 2013-05-14 by en.